Trading for a living is one of the loftiest goals of anyone who analyses the market. For someone who likes to study the market, there’s nothing better than being able to trade for a living. Your trading education plays a big part in your success. Will you be a thriving trader living off your profits? Or a struggling one busting one trading account after another? This guide links you to resources that will give you a strong foundation to trade for a living. As much as possible, I’ve focused on free resources. Better to save the cash for your trading capital. To earn enough to live off your trading profits, you need to understand trading as a profession. Hence, I’ve included resources beyond learning how to trade. These additional references will help you build a holistic trading plan. The aim is to move towards the ultimate goal of trading for a living. Do you really want to trade for a living? Trading for a living is a romantic notion. But it is a challenging endeavor. Before you spend the tremendous time and effort needed, do a reality check. 1. Day Trading Average Return – Investopedia reviews several studies that highlight the difficulty of day trading for a living. At most, only a small minority of retail traders is profitable. 2. 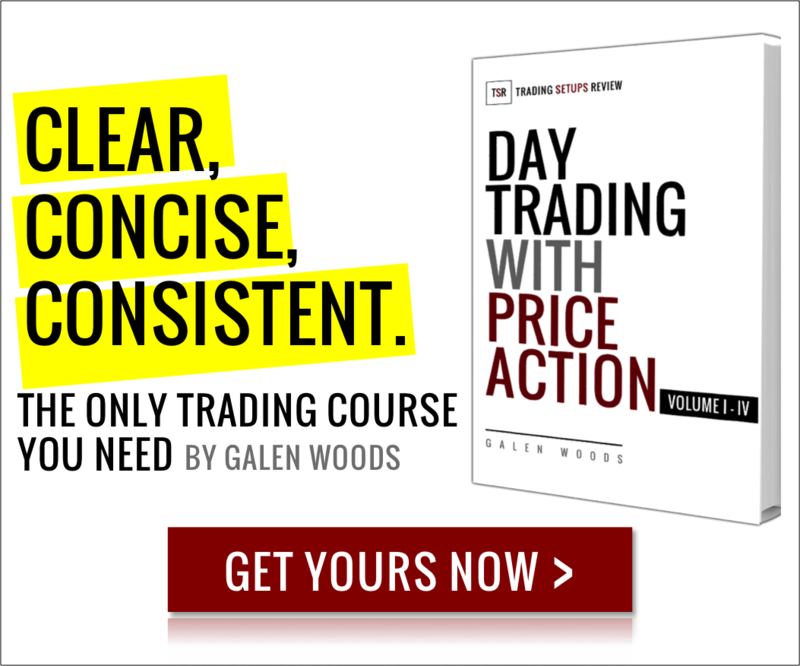 Do Individual Day Traders Make Money? – Dr. Brett Steenbarger offers his insights based on a 2004 paper that studies the profitability of day traders in Taiwan. 3. The Retail FX Trader: Random Trading and the Negative Sum Game – A recent study analyzing the performance of retail forex traders. You can find more of such studies using Google Scholar. 4. So You Want To Trade For A Living – Did you like Dr. Steenbarger’s post above? Here’s more for you. In this article, he highlights the critical considerations for switching to full-time trading. 5. Five Checks Before You Start Day Trading For A Living – Our five-item checklist for aspiring traders who wants to pursue their dream. Because trading for a living is hard, you will meet many people offering to help, usually at a cost. Because you want to trade for a living so much, you want to believe that there’s a guaranteed way to easy profits. There isn’t. Go through these resources and keep your common sense with you. They will help you avoid the trading scams and phony claims. Learn how to protect your hard-earned savings. 6. 10 Ways to Avoid Fraud – This helpful consumer guide from the Federal Trade Commission shows you how to avoid fraud. While it is not specific to trading fraud, the same principles are useful. 7. Learn About Forex Scams – The barrier to entry in the retail forex market is low. You can often fund a forex trading account for less than $100. This is also why the retail forex industry is plagued by dubious players. Learn about typical forex scams and how to avoid them from this dedicated website. 8. Penny Stocks Scam – A statement on penny stocks from the SEC. Penny stocks represent another danger area in the trading industry. Your broker might have shown you this before. If you didn’t read it then, read it now. 9. What is Market Efficiency? – This is the theory that explains why if it’s too good to be true, it probably is. The markets are not entirely efficient. But this hypothesis should remind you that it cannot be easy to make money from trading. 10. Trialling ‘learn to trade’ stock market websites: can you get rich quick? – A compelling first-hand account of learn-to-trade courses. The last two paragraphs offer an accurate summary of most trading courses. Do not think that you have to spend money to learn the basics of trading. There are many websites filled with quality free content that teaches trading concepts and technical analysis. Many of them go beyond the basics as well. The websites listed below focus on technical trading which is how I trade. The exception is Investopedia which covers a broader spectrum. 11. Investopedia – This popular financial knowledge website has a section for active traders. You can find most trading topics here. From basic chart patterns to advanced options trading strategies and valuation models. 12. ChartSchool – This is the educational section of StockCharts.com. This is the go-to place for explanations of indicators with detailed calculations and examples. 13. Technical Analysis by Incredible Charts – Together with ChartSchool, you can find information on almost every generic trading indicator, strategy, and pattern. 14. The Pattern Site – A website by Bulkowski, the author of the Encyclopedia of Chart Patterns. Well-researched information on chart patterns and candlestick patterns are available here for free. If you want to find out more about any price pattern, this is the right place to look. 15. Tradeciety Trading Academy – A comprehensive website covering all aspects of technical trading. This page shows you their top content organized into friendly modules. 16. A Trader’s Notepad – You will find a fantastic collection of 10 short modules on technical analysis and trading. It’s free and better than many paid options out there. 17. School of Pipsology – If you want a well-structured education for forex trading, look no further. The organization of education materials here is excellent. You can choose to start at any level ranging from Preschool to Graduation. Yes, and it’s all free. 18. Swing Trade Stocks – This niche site on swing trading covers the essential swing trading concepts. An excellent guide for aspiring swing traders. 19. Trading Naked – The website might look retro, but I assure you there are gems inside for any trader willing to look. Explore the menu of trading setups and have fun. 20. Trading Setups Review – Take a look our trading articles and review of various setups. I recommend that you start from this page – How to Trade with Price Action. Prefer a good old book? Here they are. 21. The New Trading for a Living – Dr. Alexander Elder’s classic piece on trading, updated. A no-hype book by an experienced trader and trained psychologist. This book is the best introduction to trading for a living. 22. High Probability Trading – A balanced trading book that covers the aspects of successful trading from a realistic perspective. 23. Trading in the Zone – Trading for a living requires you to be comfortable with probabilities. You need to be confident despite being uncertain. This trading psychology classic will shift your mindset to achieve this goal. 24. The Daily Trading Coach – A practical book for improving your trading psychology by a leading trading psychologist. 25. Thinking, Fast and Slow – A trader needs to deal with all sorts of cognitive and psychological biases. For this, it is best to learn from Daniel Kahneman, winner of the Nobel Memorial Prize in Economics. 26. Market Wizards Series – Through Jack Schwager’s astute questioning, you can learn from the top traders in the world. Priceless. 27. Reminiscences of a Stock Operator – Jesse Livermore’s life is about trading. Learn timeless trading wisdom through his experience. 28. Technical Analysis of the Financial Markets – For those who are looking for a friendly guide to technical analysis. 29. Technical Analysis: The Complete Resource for Financial Market Technicians – The official companion of the Chartered Market Technician (CMT) program. If you want a formal textbook on technical trading, this is it. 30. Technical Analysis of Price Charts Bar by Bar for the Serious Trader – A comprehensive collection of price action observations. Tough to read, and not recommended for novice traders. To make the most out of the websites and books above, you will need a charting platform to practice what you learn. 31. Yahoo Finance – Key in a symbol and select “Interactive” under Charts. You’ll find familiar technical indicators with a clean interface and free data. 32. Google Finance – Offers a basic technical chart with a useful news overlay. Great for studying the impact of news on stock prices. 33. TradingView – Friendly and sleek interface with a comprehensive set of technical indicators and chart markers. You can even write custom indicators with its Pine Editor. 35. MetaTrader 4 – The most popular forex trading platform with a large supporting community. It’s free, and you can hook it up to almost any forex broker. 36. Forex Tester 3 – A dedicated forex trading backtesting software that allows you to backtest mechanical strategies swiftly. You can also use it to replay price action for testing manual strategies. Click here for our full review of Forex Tester 3. This is a burning question of an aspiring full-time trader. These articles do not give a definite number because It’s impossible to do that. You need to form your own figure. But with these articles, you will get a good idea of what to consider to arrive at the answer. 37. A Guide to Keeping Track of Your Finances – Nothing to do with “trading”; everything to do with “living”. If you don’t know how much you need to make a living, you can never figure out how much you need to trade for a living. 38. How much money do you need to trade for a living? – Brian Lund has written a book packed full of tips from over sixty traders. This is his take on how much you need. 39. Trading for a living: how much do you need – Adam Grimes highlights the inherent variability of a trader’s income. 40. How much money do I need to start day trading for a living – This article shows that individual circumstances matter through 3 fictional traders: Fearless, Retiree, and Zen. 41. Pattern Day Trader – If you intend to day trade stocks and options, the FINRA has an exact figure for you – $25,000. But this is the regulatory minimum, not the amount that you need to pull it off. After working out how much you need to trade, you might need to start saving up to launch your day trading career. Remember to risk only the money you can afford to lose. 42. Saving Up: How to Fund Your Own Small Business When No One Else Will – Funding your trading account is not that different from funding your own business. 43. How to Save Cash to Start a Business – Some money-saving advice from the U.S. Small Business Administration. 44. Money Saving Guides – A compilation of guides from The Guardian to help you budget and save up. 45. How to Save Money: 100 Great Tips to Get You Started – Every bit you save goes towards fueling your dream of trading for a living. To trade for a living, you’ll need a reliable trading office setup. You trading computer will be the centerpiece of your trading office. You need a reliable workhorse as your trading terminal. If your current machine is not up to scratch, consider getting one from the websites below. 46. How to Organize Your Home Office – A step-by-step guide to setting up your home office. 47. How to Ergonomically Optimize Your Workspace – Don’t sacrifice your health for trading. Learn the right working posture for your long trading sessions. 48. Puget Systems – An experienced high-performance custom computer builder. 49. Trading Computers on Amazon – Complete trading solutions listed on Amazon. Various multi-monitor setups are available here. 50. Gaming Computers – Most gaming computers are suitable for trading. Choose one within your budget. Every trader needs a broker. Here are some resources to get you started on your broker search. 51. How to Choose Your Day Trading Broker? – Our concise guide to choosing your broker. 52. Barron’s 2015 Best Online Broker Ranking – A definitive broker ranking published annually. 53. Compare Online Brokers – Get a side-by-side broker comparison here. 54. Interactive Brokers – If you want to trade a variety of instruments in global markets, Interactive Broker is a great option. 55. TradeStation – A consistent entry on online brokerage firm rankings. Suitable for active traders looking to trade multiple instruments. 56. TD Ameritrade – Offers a full suite of online tools and a friendly platform to help you learn. Suitable for new traders who want to start slow and steady. 57. Lightspeed Traders – Targets active traders with its aggressive pricing and fast executions. 58. Oanda – Well-regulated forex broker. No minimum trade lot size. Suitable for traders who are still in the learning stage operating small accounts. 59. NinjaTrader Brokerage – The futures brokerage of choice for NinjaTrader users. Learn more about our partner here. 60. OptionsHouse – A reliable options broker with discount pricing. The resources above might not be enough for you. You can find more help from other traders through these active trading forums. They are also great avenues for you to meet other people who are trading for a living. 61. EliteTrader – One of the most active trading forum with over 150,000 traders visiting per month. Check out the “Trading for a Living” section. 62. Futures.io – An organized forum with a strong focus on futures trading. 64. Trade2Win – T2W has a Home Trader thread where you can find topics related to trading your own account from home. 65. Traders Laboratory – Not as active as the forums above, but it has an informative section on Volume Spread Analysis. 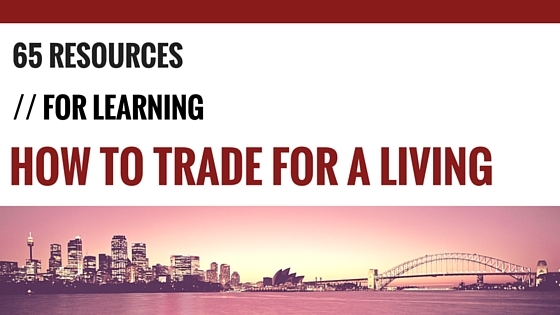 These 65 resources should be enough to get you started on your path to trading for a living. Are there any other resources that you think should be on this list? If so, please share them in the comments below.